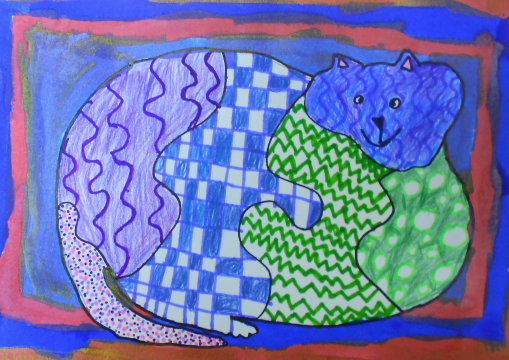 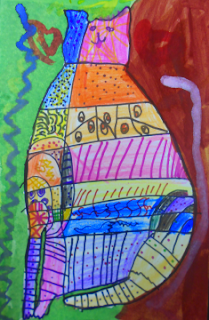 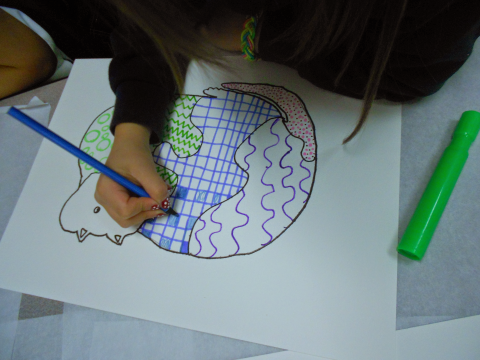 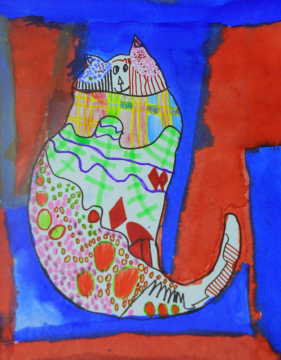 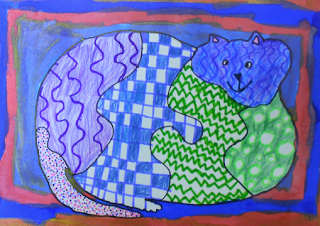 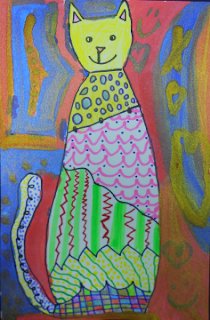 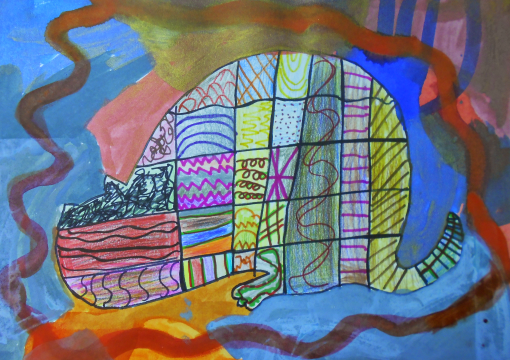 This cat project demonstrated our understanding of how to use the elements of art in an effective way. 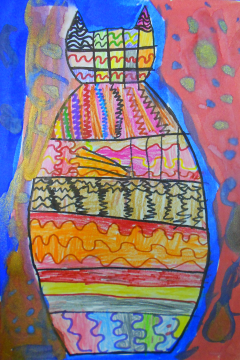 in order to exhibit a variety of lines, shapes, colors, textures, and patterns. 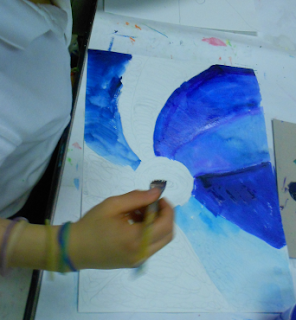 Students were advised to include at least two elements in their compositions. We also had a discussion on how science has elements such as hydrogen, carbon, and oxygen; Literature has settings, characters, and plots; and music has elements such as rhythm, melody, harmony, and tempo. 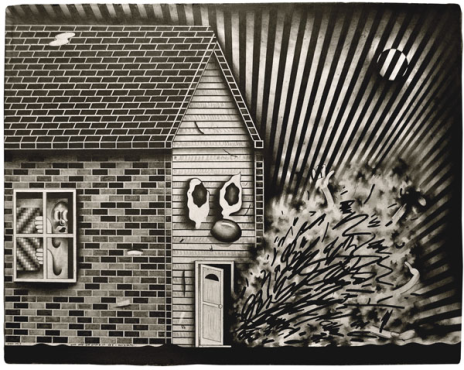 The Contemporary Art Museum in Raleigh is presently holding an exhibition of artworks by Ryan Travis Christian, entitled " Well, Here We Aren't Again." 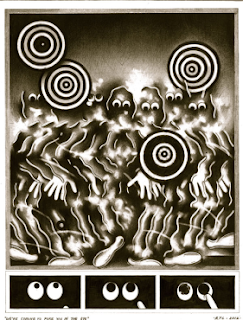 Christian is a Chicago-area artist who enjoys working with graphite and ink. 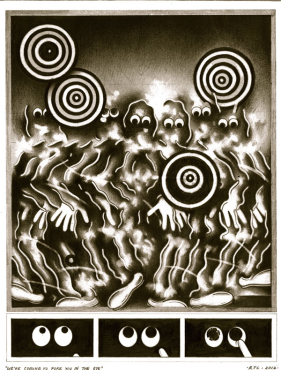 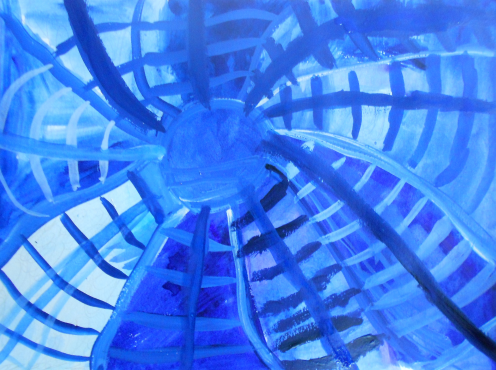 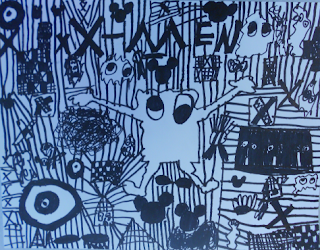 In his work you can view abstract elements, comic characters, and cartoon iconography. 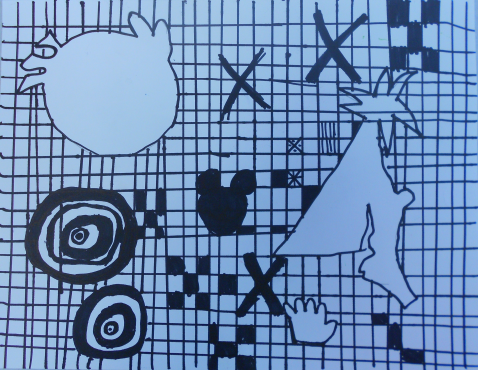 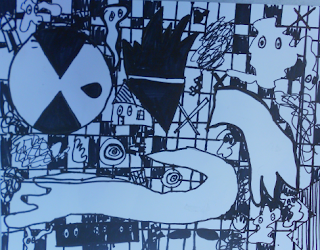 The students viewed his work and loved his use of graphite and ink, as well his use of cartoons. 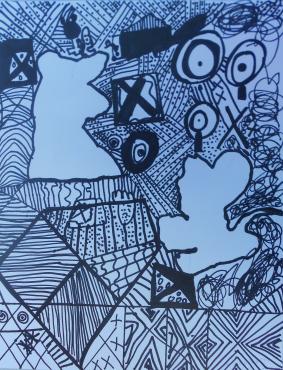 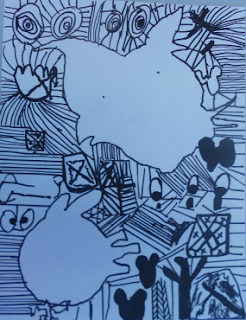 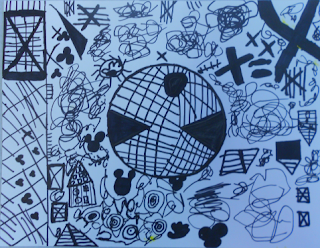 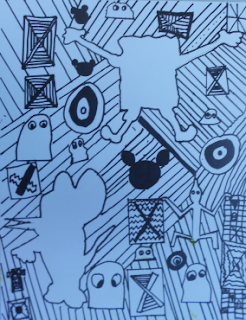 We decided to create our own compositions using black sharpies. 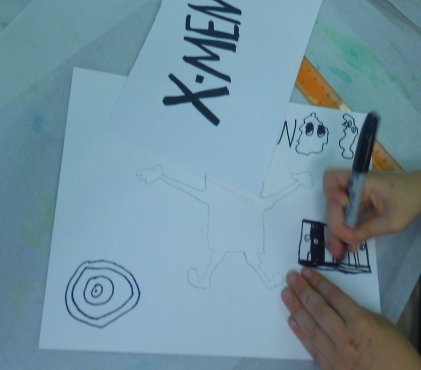 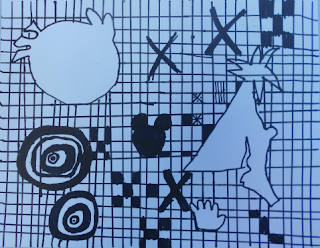 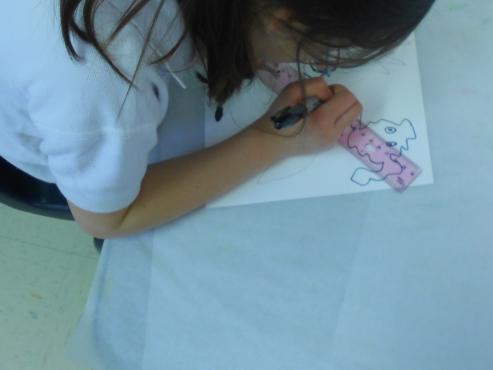 Students created stencils of their favorite cartoon character and found a way to incorporate the image in their design. We were also free to incorporate our favorite images from Christian's work. 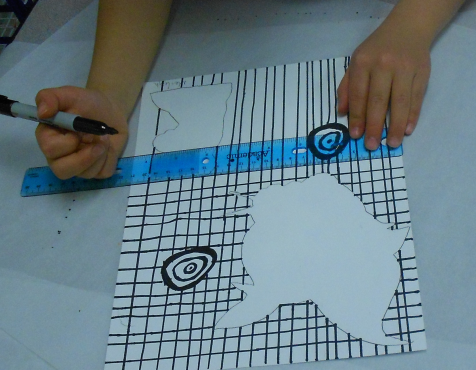 This project gave us the opportunity to review the concept of Line. 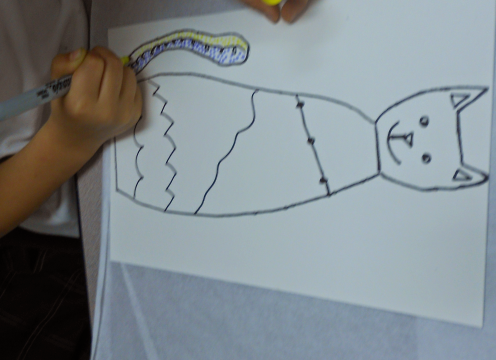 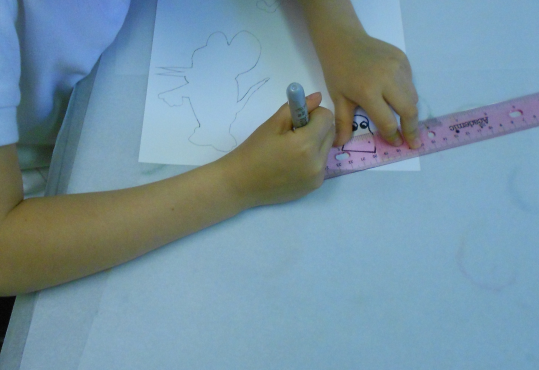 We discussed how a straight line tends to make our eyes run along its length. 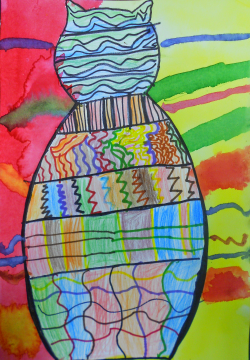 In analyzing Christian's design, we saw how horizontal lines tend to be calmer and vertical lines tend to be more bouncy and alive. 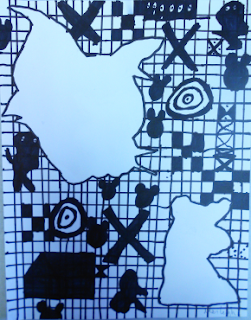 In Christian's Xs, diagonal lines can move in and out of the picture plane more than horizontal or vertical ones. 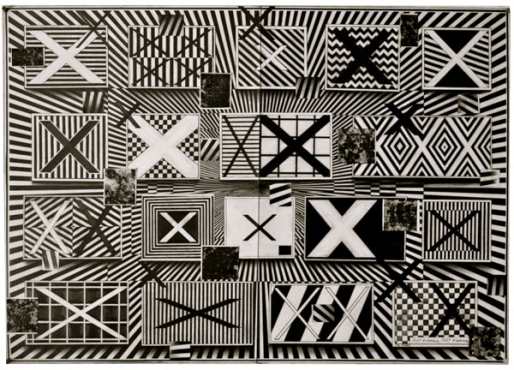 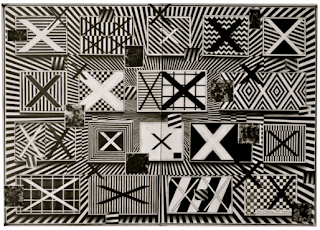 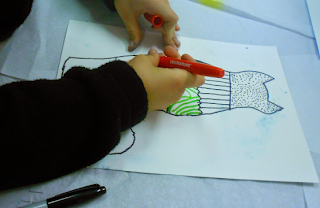 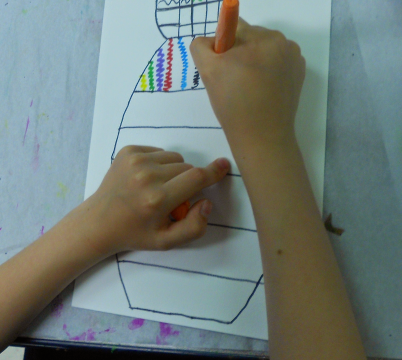 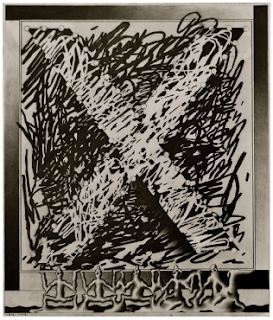 In Christian's work we saw how lines can be real or implied, thin or thick, straight or jagged. 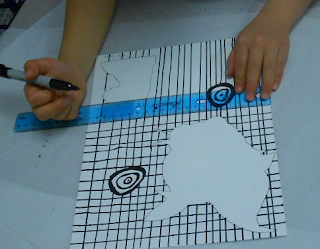 Using rulers to create a checker board design. targets and the poking eyes and the Xs from Christian's works. 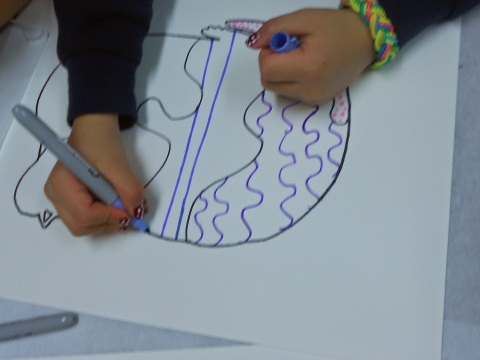 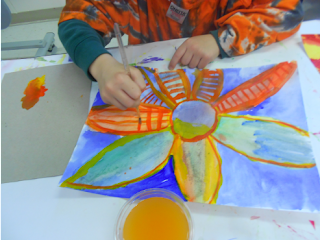 For this lesson we looked at the work of Georgia O'Keeffe. 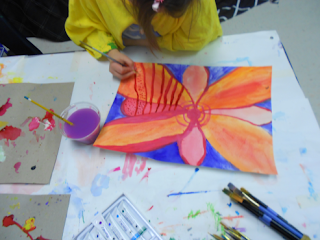 We discussed how she created large paintings of flowers, as if she wanted the viewer to see their beauty through a magnifying lens. 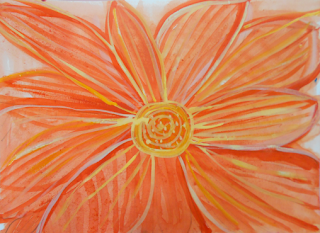 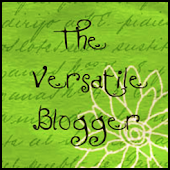 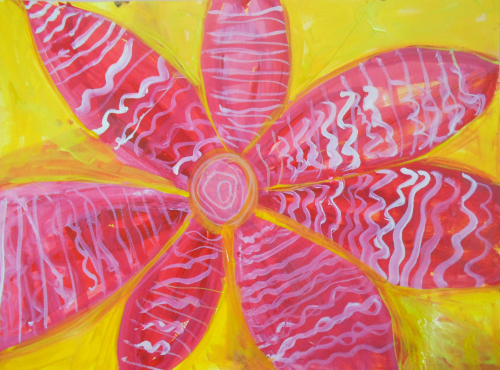 She said: "I decided that if I could paint that flower in a huge scale, you could not ignore its beauty." 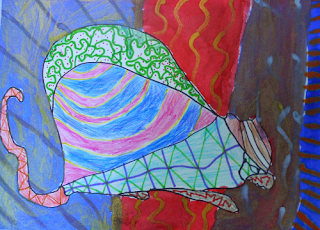 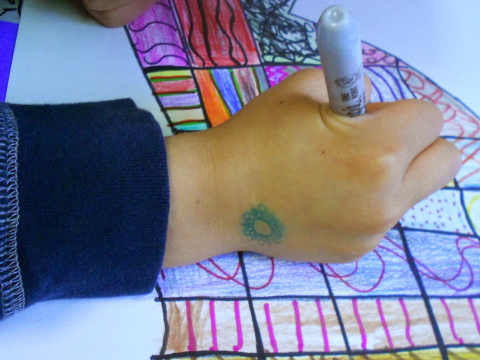 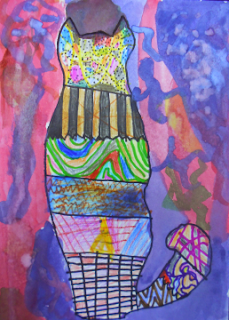 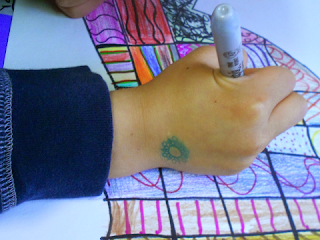 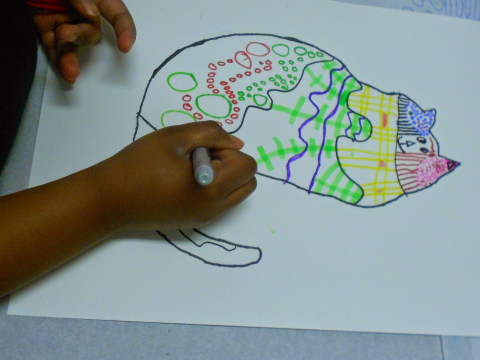 The students looked at pictures of her work and they were amazed with the beauty of colors and lines. 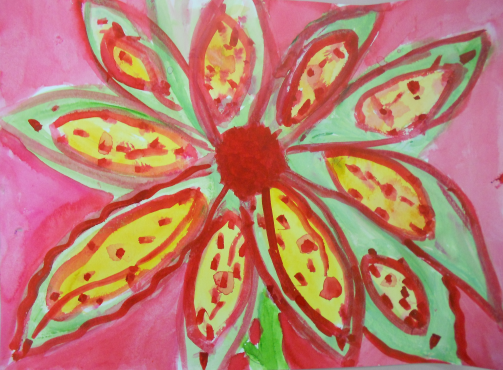 She also said: "When you take a flower in your hand and really look at it, it's your world for the moment. I want to give that world to someone else. Most people in the city rush around so, they have no time to look at a flower. 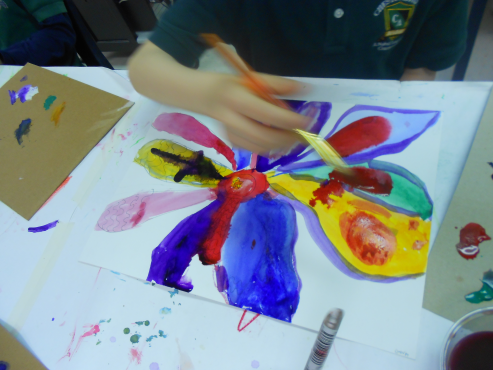 I want them to see it whether they want to or not." 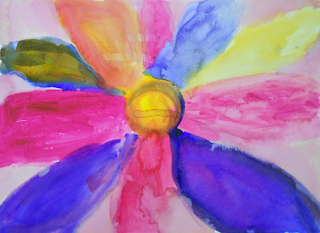 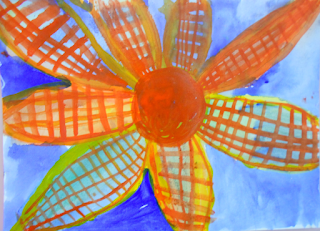 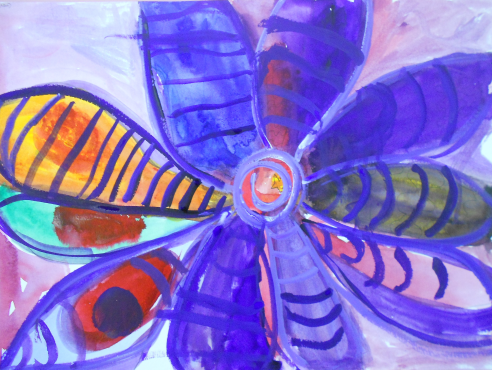 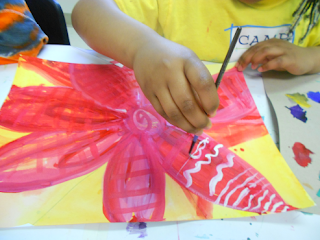 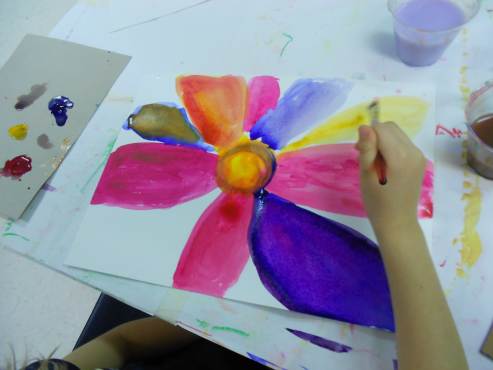 We used water colors in order to create our large-scale flowers. 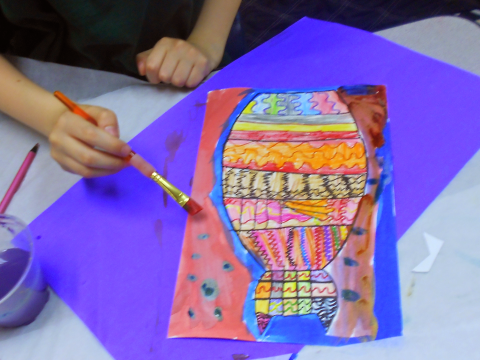 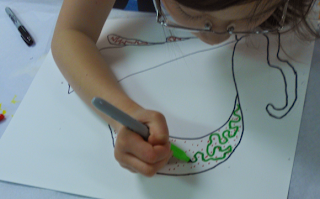 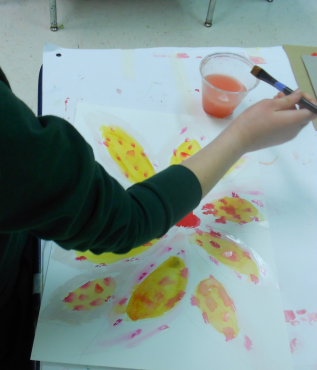 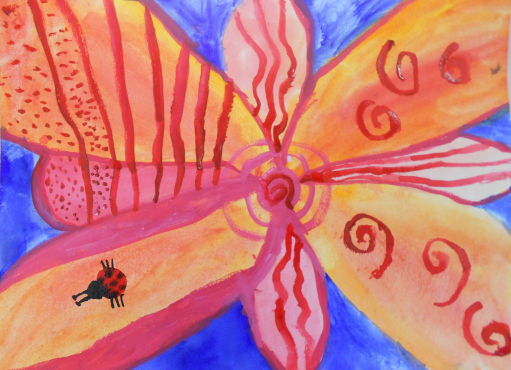 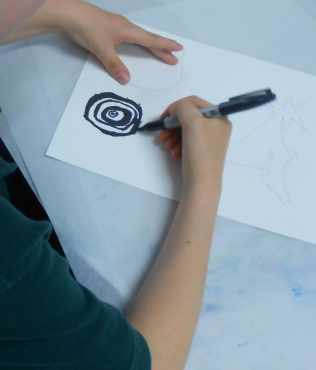 Students were encouraged to use a variety of brushes and colors.